Alfa Laval adiabatic liquid coolers provide clean water at the right temperature for industrial processes year round. The modular Alfa Laval adiabatic liquid cooler units, positioned outside a customer’s facility, is the closed-loop system’s central process liquid cooler. 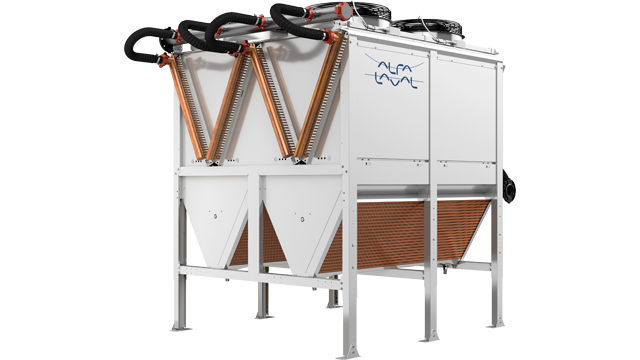 Alfa Laval adiabatic liquid coolers combine well proven heat exchanger coils with an internationally patented adiabatic pre-cooling section. Heavy duty heat exchanger coil and casing, manufactured from corrosion resistant materials. An acrylic coating is applied to the cooler coil for added protection against harsh environments. All ABT units are fitted with an adiabatic booster section that can be used to pre-cool incoming air on hotter days. A wide range of heat exchanger configurations is available to maintain precise cooling conditions, no matter the climate. Up to 20 fans in 1 or 2 fan rows. ErP compliant EC fan motors with external rotor, protection class IP 54 according to DIN 40050. EC power supply 380-480/50-60/3 with integrated thermo contacts to provide reliable protection against thermal overload. For a full overview of all available options and additional technical specifications please refer to the product leaflet. Using dedicated selection software, Alfa Laval adiabatic liquid coolers can be configured to match manufacturers’ specific requirements, delivering higher energy and water savings, environmental benefits and other advantages. Please contact Alfa Laval for support and selection. Find manuals, electrical drawings, CAD drawings, High Resolution pictures and certificates. Find out more about Alfa Lavals closed-chamber adiabatic cooler optimized for different applications to deliver long-term savings in water, energy, chemicals and maintenance time. High-temperature ambient air passes through lower adiabatic chamber. Inside this chamber, nozzles spray the coil with a fine mist of water from a separate source. 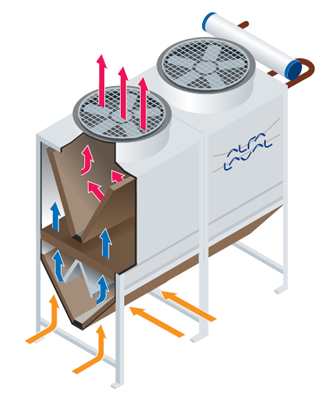 The air is cooled due to humidification, prior to contact with heat exchangers. The chamber’s design prevents any water drift outside the chamber when the cooled air travels to the heat exchanger. Digital control system continuously adjusts the amount of water sprayed to ensure consistent cooling.